Since 2001, the Innocence Project New Orleans [IPNO] has freed 33 innocent people from spending their lives in prison in one of the very harshest states in America. We spoke to Jee Park, the group’s executive director, about racism and the quest for justice, in Louisiana and everywhere. Park began her legal career at Bryan Stevenson’s Equal Justice Initiative, and later worked as a public defender in New York and New Orleans. She has began working for the IPNO in 2017, and became its director last year. Splinter: Louisiana has one of the highest incarceration rates in America. Why is that? Jee Park: We have really harsh sentencing laws. One of the immediate things I noticed when I came down to New Orleans to become a public defender was that all drug possession cases are felonies here. Whereas in DC and New York, small amounts of cocaine or heroin are misdemeanors... That, coupled with the fact that we have a fairly harsh habitual offender statute. If you’re dealing with a prosecutor who is heavy handed with the habitual offender statutes—it’s completely discretionary—a lot of the prosecutors do use it as a hammer, so there you go. You get a lot of people [who] do a lot of time for nonviolent offenses. Splinter: When you were working in the public defender’s office, did you feel like a lot of people working in criminal justice here thought the system needed to be reformed? Park: I think the sentiment has been changing since [Hurricane] Katrina. I think the New Orleans criminal justice of today is 180 degrees different from what was happening in 2005 or 2004, before Katrina hit. When Katrina hit the city, it exposed the underbelly of what was happening in the system. There are some really damning photographs of the jail prisoners on the bridge, waiting for transport for hours. We have a client who is now exonerated who was 17 at the time he was arrested. He was in Orleans Parish prison. To this day he has a really hard time talking about this, but he was in a locked prison cell with the water rising, and by the time he was rescued, the water was up to his chest. He thought he was going to drown in his cell. And he was 17 at the time, he did not commit the crime, and he was exonerated ten years later. Those types of images, those types of stories, and how the system was completely broken... given that history, the community and the city has worked really hard to come out from that. Splinter: How does the IPNO identify the cases you’re going to take on? Park: The prisoners have to write to us first. A lot of times family members call, but we have to have the prisoners themselves ask us for help. It starts with a letter. Once we get the letter, we start the process of pulling all the publicly available documents and doing a screening. At the moment we have over 5,000 cases in our queue to be reviewed, and because of the size of our organizing—we have 14 full time staff members, and only six are attorneys—the amount of cases we can take is pretty limited. Once we accept the cases, the amount of time it takes us to actually exonerate someone, our average is about ten years... It’s a fairly intensive screening process. We spend two to three years investigating a case even before we accept representation of that individual. We’re not working on technical issues—we’re looking for factual innocence. There’s a lot of people in this country who are wrongfully convicted because they did not receive procedural justice. We’re concerned with that, but we’re also concerned with factual innocence. We need to discover new evidence that was never presented to the jury that’s going to be presented for the first time in a post-conviction hearing. Splinter: What portion of the requests you receive do you investigate to the point that you can say the person is innocent? Park: We have had cases where we investigated and a case got worse. [Laughs]. We’ve had instances where, before we DNA test, we ask the client, are you sure? If it comes back, it’s not like we keep that information to ourselves. We share it with the court and we share it with the prosecutors... We go into every case with an open mind. A lot of times, we do believe in someone’s innocence, but we actually cannot find any new evidence to get it back into court. Splinter: What portion of people in jail do you think are innocent? Park: There’s been a lot of studies on that. I think the number is anywhere from one percent to four percent. Even if it’s one percent, there are 36,000 prisoners in Louisiana, so we’re talking over  prisoners are potentially innocent. That’s the conservative estimate, and some scholars who have looked at this issue think it’s as high as four percent. That’s shocking. And everyone we represent is sentenced to life in prison. Because of the length of time it takes to litigate a case, we unfortunately can’t represent someone who’s sentenced to seven, or eight, or even twelve years. Splinter: Tell me about what the IPNO does to support people after they get exonerated and are released. Park: We have a social worker on staff—we call her [a] client services specialist—and she works with them to get housing, to get employment, to get family support. The fact of the matter is, when you serve 37 years in prison, a lot of your siblings have passed away. A lot of your family support network doesn’t exist any more. For many of our clients who have children, they kept in touch with their children, and the children have taken on the responsibility without our assistance. But we have some clients who are not very close to their families, so we have become their family essentially. We also try to help them with compensation. We try to apply for state compensation, and then if we think they have a decent civil case, we don’t handle it ourselves, but we certainly introduce them to other civil lawyers who may be able to litigate a civil claim. Splinter: What’s the law in Louisiana about compensating people who have been exonerated? Park: It’s horrible. It’s miserably bad. It’s $25,000 per year, capped at $250,000. So for our client John Floyd, he did 38 years in prison—he was arrested in 1980 and he was exonerated in November of [last] year. He’s only going to be compensated for $250,000. It’s nothing. They have a separate thing, “loss of life” compensation, it’s $80,000, but you can only use it for the first three years that you’re out for vocational and educational training, and for the first six years for health. You can sue on top of that... but civil lawsuits are hard. People think that when you get out of prison and you’ve been wrongfully convicted, you’re gonna become an automatic millionaire or something. There is strong immunity against lawsuits, particularly for prosecutors. And it’s rather difficult to sue the city and the police as well for misconduct. So more times than not, our clients don’t get anything through the civil system. Splinter: How good is the public safety net for your clients who get released? [One of the root causes of wrongful convictions] has to do with funding for public defense. Funding for public defense in Louisiana is primarily through traffic tickets. So there is continuous funding turmoil and disruptions because it goes up and down depending on how many tickets the police give. How ridiculous is that? It’s a really horrible system. Splinter: That’s an obvious policy change that would help the situation. Are there other policy changes that would keep innocent people out of prison? Park: New York just passed a law that created a separate commission to oversee prosecutors. Because what we’ve seen across the country is that even for those prosecutors who’ve intentionally misled the courts, there was no recourse for that. They never lost their law license. They don’t even receive a slap on the wrist. So having a true independent commission that keeps that body of actors accountable is really important. Splinter: Do you think you have much support among statewide elected officials for what you do? Park: There’s a real close alliance between elected officials and their district attorneys in this state. The district attorney’s association is a very, very powerful lobbying body. Particularly in these rural parishes, they will tell you up front, “Oh, we don’t have wrongful convictions in my parish.” So there’s a little bit of denial, I think, for them to think their system works perfectly in their jurisdiction... but I think it’s been helpful that we’ve had podcasts like Serial and Netflix series that kind of show the public, at least, how things can go completely off the rails. 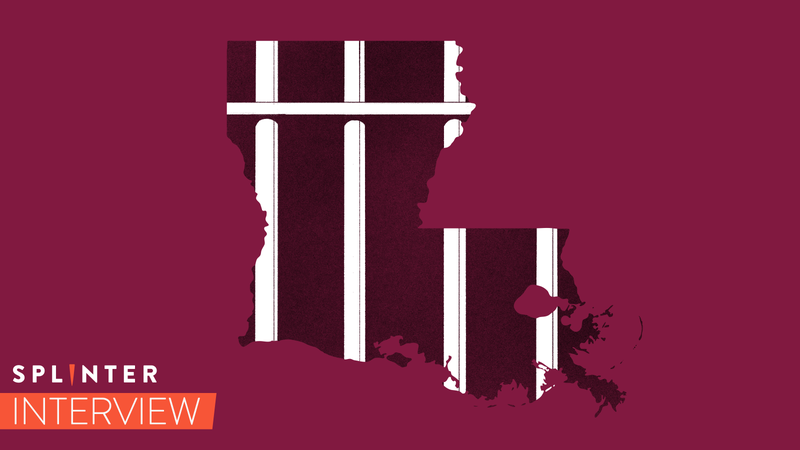 Splinter: What role do you think race plays in the criminal justice system in Louisiana? Park: Everything. Just look at the population of the prisoners in Louisiana. You go down to Tulane Avenue right out here, Broad and Tulane is the criminal courthouse. You walk into the criminal courthouse, any of the courtrooms, and you’ll see who’s sitting in the audience. It’s the black families, the black mothers, the black sisters. The defendants then walk in in the orange jumpsuits. They’re all black men. And it’s not because black men are the only ones using drugs, or are the only ones battering their wives. I think racial bias is definitely endemic in our system. You see it in every respect. Splinter: Is there a way to mitigate that, short of huge social change and economic revolution? Park: I think there can be, especially in terms of nonviolent drug offenses, and really seeing that as a public health issue and not a criminal issue. Getting folks treatment as opposed to getting them into the criminal system... People have written a lot about the school-to-criminal justice pipeline. If you look at our juvenile justice system, 99 percent of the children arrested, certainly in New Orleans, are black children. For minor stuff. But getting them into the system, getting them into the juvenile facility, that is not a way to help someone who is in need. Splinter: Are there any particular cases or themes that stand out in your mind as emblematic of your work? Park: There’s several themes that arise from most of our cases. One, all but one of our clients that we’ve had are black men. They were all arrested either when they were teenagers, or in their early 20s. All of them are poor. All of them received really pitiful, horrible representation, either by a private lawyer that the family hired or by a public defender. And for most of them, the fact presentation part of their trial lasted a day. Maybe a day-and-a half at most. So these are cases where no defense is actually being presented, and where the defense is not actually challenging the state’s case. And in all of these cases, there’s either faulty science that’s presented, or incomplete science... and the prosecutors relying really heavily on eyewitness identifications and informants. Splinter: What’s a good way for regular people to help out with these issues? Park: We need to pay attention to elections. Prosecutors hold tremendous power in our communities. People don’t even realize how much discretionary power they exercise on a daily basis. Paying attention to the prosecutorial elections—and no one does. Once you get into office, it’s almost like you won the lottery. Every single prosecutor in Louisiana is up for election this year, 2019. I would be surprised if even a handful of them have challengers... and also paying attention to local judge reelections. Judicial elections are really important. Judges need to be a check against prosecutorial abuse and overreach, but a lot of times they’re not. Splinter: And donate to the Innocence Project New Orleans? Correction, 3:04 p.m. ET: This post initially said that Park’s group was called the New Orleans Innocence Project. In fact, it is called Innocence Project New Orleans.